Pepperhead Studios is the creation of musician Jeremy dePrisco and it’s more than a place where people can record their work. It’s also the name he asked me to use when I noted one of his albums in an article last year. He’s best known for his electro-acoustic “Shivasongster” performances and as part of the Americana duo “Fricknadorable” which he performs in with his wife Audra. Although both members of the band were involved in the creation of Haunted 2016, it’s very different from their usual mix of ukulele and blues guitar. But how did such an album come to be? The answer is very simple: Jeremy dePrisco loves Halloween and, like so many enthusiasts of the holiday, had amassed a large collection of scary sound effects albums over they years. When you enjoy such albums and have access to your own recording facility, it’s pretty much a given that you’ll create one of your own. The project combined material taken from his past field recordings and all new material. There’s not a single sample from another artist’s work, internet download or synth creation to be found and that’s a welcome breath of fresh air in this sort of project. Both the dePrisco created the new sounds in a single location over the course of two weeks in October 2016, with Jeremy handling the foley effects and both providing the vocals. The fact their home is a former church made for some great acoustics and kept the need for processing to a minimum. The resulting hour and a half’s worth of material was played on the same day the album was released: Halloween! “Haunted 2016 Part 1” runs a little under 8 minutes and it’s actually the album’s shortest track! Given the length of the album, I can’t list every single thing in detail. But I’ll try to cram in as much as I can! We get to hear clanking chains, metal objects being dropping on ground, evil laughter and stomping feet in addition to the droning background sounds. It might sound vaguely like music at times but an email to the artist quickly confirmed it’s actually just sound effects that have been slowed down. The dropping sound effects happen many times throughout the track (and even close it out). The chains, stomping and evil laughter all return at various points as well. There’s also heavy breathing, rumbling noises, knocks, groaning drones in the distance, moaning, unfamiliar noises, monstrous yells and screams, a faraway creaky door, storm sounds, spooky breathing, two sources of sinister chuckling and even a power tool! “Haunted 2016 Part 2” opens with soft clanking chains and rumbling rolls. The soft zombie-like groans in the back are a great touch. The rumbling noise vaguely reminds me of stone slab being moved at times. There’s also more groaning and stuff I can’t quite place. An evil laugh, monsters breathing and other noises are heard at times and creates the sense of monsters skulking about in the dark. A shaken coil creates an interesting effect too. Although there are scattered drum strikes, they don’t sound like traditional music of any kind. Something can be heard being dragged on floor when more rumbling comes in. The coil effect actually gets a solo at one point before we hear a table being moved about and breathing. Later a power tool and something large dropping or slamming can be heard. This leads to a monster breathing and more distant tool sounds. We can ever hear something being cut at one point. After some slamming, cranking and stomping, a door can be heard opening. More distant doings are heard in the background, along with a soft thud. More coil noises can be heard, along with breathing, crying or laughing, coughing, an evil child laughing and whispering, drum strikes, a door opening and wet eating sounds. The track closes with the sounds of cranking and and cries of pain to imply a torture rack being used. Does “Haunted 2016 Part 3” start off with the sounds of creaking or bats? You decide! Its droning backing tone sound similar to howling wind and remain a constant for much of the track. Growls, noises that are hard to place, and ghostly backing noises take us to a mix of crackling fire and some bubbling. More soft growls and metallic strikes lead to more crackling fire and either squeaking or creaking. A howling ghostly “wind” in the background becomes constant as a monster breathing and distant knocks join the party. Metallic strikes and bird calls make for an interesting change of pace. The combination of the fire effects, bubbling and “wind” are awesome. The rest of the track is mostly metallic noises that are hard to place and monster groans. Once the “bats” are heard again, we get lots of silence. But given how there are little bits of silence scattered through random parts of the album, this isn’t an issue and actually provides and opportunity for a jump scare from a hidden performer. “Haunted 2016 Part 4” has a lot of dripping and wet sounds placed throughout it, including the sounds of footsteps in water. Said effect first happens not long after the track’s opening evil laughter and takes us to the sounds of chains rattling and objects being struck. The distant stomping on the floor is the first of many soft, distant noises. Shoes can be heard squeaking on floor, along with more chains and distant noises. Coins dropping on the ground and evil laughter can be heard prior to something being hit over and over. Chains become a constant presence in the track and a brief moment of silence soon gives way to distant stomps and someone slamming on drums. The slamming and chains get closer and louder. At one point what sounds vaguely like a pull chord and some sort of motor running can be heard. An evil laugh takes us to effects like footsteps, drum strikes and a creaking metal door in distance. Chains rattle and new types of objects can be heard dropping. Many of these are repeated before a deceptive silence leading to loud rain and wind sounds. An evil laugh also joins in and chains get slammed onto the ground too! Sadly the storm fades out for another period of silence. “Haunted 2016 Part 5” gets volume back to normal again, just in time for the opening of a creaky door. A loud slam implies the door is now closed as slow drum strikes meld with the soft wind (or droning) in the background. Metal objects can be heard being dumped and moved around the floor. Monster moans take us to the door opening and slamming shut again, along with some slow strikes and odd noises I can’t quite place. But that does make things a little creepier, now doesn’t it? I think the clacking and rattling heard moving around about the room are supposed to be skeleton bones. Rumbling drones make up the background as monstrous breathing and echoing strikes make the first of many appearances in track. There’s also a new take on the coil sound which is drawn out this time around. The monster laughs in this track also have been altered and distorted to creepy effect. Tapping and metallic noises can be heard, along with a sound which reminds me of an improvement on the cranking noise from earlier in the album. Monster noises come before an electric drill starts up. The drill goes on for awhile has some interesting variations before getting turned off. This is quickly followed by creepy droning and more interesting noises I can’t quite place. The sounds of a furnace door and various monster noises lead to distant effects and some near silence. But the return of the cranking noise and creaking door change that really quick! Soft outdoor noises are blended with slamming and rumbling. A terrifyingly deep evil laugh is heard and is soon followed by chains. Although these effects return later in the track, they are never combined. New monster noises and wails spice up the distant moaning drones and up close chains. A monster breathing and groaning takes us to chains clanking and objects being hit, along with some thunderclaps. Creepy backing tones and booming footsteps in distance lead to a brief break before the epic final track begins. 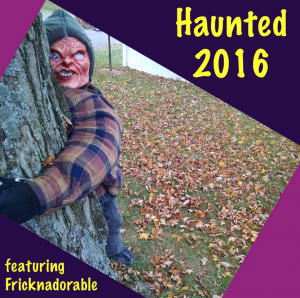 “Haunted 2016 Part 6” is over a half hour of sound effects! Power tools, chains, a modern horror movie-style sting, wet eating and creepy guttural backing tones are heard in rapid succession. Next comes snarling, a person crying, booms, incredibly eerie backing noises, drum strikes and lots of creepy noises I can’t place. New dropped object effects are heard in addition to old classics like chains. At this point the backing noise is like a monster and you can even hear a scared victim at times. The monster’s moaning roar and another modern horror sting lead to a power tool. But the tool is turned off once something is knocked over. Scared gasps, rumbling, knocked over wood, clanking junk, monster noises and chains are heard before the power tool returns. We get a monster’s groaning yell and horror sting before the new monster noises kick in. This time the unseen beast seems rather amused. Laughter is heard and other monster quickly joins in. Wind-like drones and other unidentifiable noises takes us to distant pounding and monster noises in the foreground. Chains are heard hitting ground along with distant pounding, rattling, drum strikes, droning and soft monster noises. The chains return and an object is heard being kicked on the floor. I loved how soft monster noises can be heard under other miscellaneous noises. New monster groans and revving drills can be heard among a horror sting, drum strike, strange noises, scared gasps, a crying woman, monster snarls, evil chuckles and and a creepy backing. A loud laughing monster duo can be heard up close. A power tool, horror stings, soft monster noises, drones, odd noises, monster breathing, whispers, objects knocked over and a brief use of chains can also be heard. But what about the finale? It offers lots of soft disturbing noises, chains and a distant drill. Haunted 2016 is a dead-on perfect tribute to the scary sound effects albums of the past. It’s easy to imagine it becoming the soundtrack to numerous garage haunts and yard haunts. That said, “Haunted 2016 Part 4” could potentially be used in a haunted house’s sewer scene and any track from the album could work in a dark maze. Each track is more than long enough to be looped individually and the whole album can easily be played in loop on October 31st. Which makes sense, given as how that’s what this album was designed to do! Even if random dropping sounds are not to your liking, weird random sound effects are an undeniable part of haunt sound history which date back to the early 1920’s! Perhaps that ties into why so many old dark rides combined random stunts and sounds! That gives me an idea. Although many associate the term “yard haunt” with a completely themed setup in a yard, it’s just as easily apply to yards which are stuffed with random Halloween decorations. Wouldn’t the mix of sound effects from Haunted 2016 compliment the randomness of such a display? It even works with houses with only a couple decorations, as we’ve probably all been to at least one house with random scary sound effects as kids on Halloween. No matter what option you take, be sure to take a cue from the album’s cover art and include a stuffed dummy somewhere. Although a flannel shirt is traditional, a spare sweatshirt is also appropriate. If you don’t have a spare mask, stuff the neck of the shirt with something red and present it as a headless body! A few gravestones and a lot of fake webs will add to the effect. Don’t be afraid to really stretch the webs out. It might look like the webbing will be pulled apart completely, but it’s often stronger than you think. You can find a giant spider at most major pharmacies, so you might want to consider buying one to place nearby. A stuffed white trash bag can be shaped with masking tape or white twine and covered with more fake webs to make a webbed victim. A red or green outdoor light will make your house very creepy. You might not even need any other decorations once you do that! But it’s more fun to put them up. You can hang torn cheesecloth in the windows to make spooky curtains. You can easy make fake chains to hang in the windows uses scraps of aluminum foil. Just roll the foil strips into thin strands and form a loop. Then it becomes like making paper chains in elementary school! Only you press down and twist the ends of the loop to close it. Sometimes you might have to snip off the excess with scissors. Since the ends of the strands can get rather pointy, either use work gloves or a butter knife to press them down safely. They look surprisingly realistic when seen from a distance under dim lighting. I like to hang mine straight down and use a hidden oscillating fan to randomly blow some of them around. Homes with forced air heating can also create this effect without fans if you hang them from the right spot. People really get surprised when they see chains jangling themselves! They’re bound to match up the numerous chain effects from the album at some point, which will only make things creepier. Considering how Haunted 2016 both released on Halloween and tested on actual trick-or-treaters, I can’t see how people wouldn’t be tempted to at least check it out. The album is currently only available as a digital download and its download page handily notes how home haunts can use the tracks royalty free upon purchase. Not only that, but Mr. dePrisco has informed me he is considering making a sequel which combines music and sound effects! What’s not to love? Special thanks to Pepperhead Studios for use of the image!